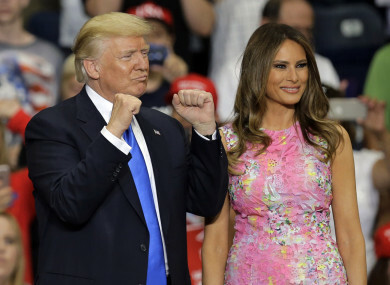 President Donald Trump pumps his fists as first lady Melania Trump watches crowd. US ATTORNEY GENERAL Jeff Sessions found himself in an increasingly untenable position yesterday, as President Donald Trump once again publicly skewered his top law enforcement official, calling him “VERY weak” and saying he is “disappointed”. Sessions was one of Trump’s earliest and most loyal supporters, but the Republican billionaire has turned on him publicly in the past week, as rumours fly that the former senator from Alabama will be replaced. Trump has openly criticised Sessions for recusing himself from overseeing a federal probe into possible collusion between the Trump campaign and Russia to meddle in the 2016 US presidential elections. Yesterday, Trump berated Sessions over what he deemed insufficient efforts in pursuing intelligence leaks and for failing to go after former Democratic presidential candidate Hillary Clinton over her private email server. Later, he again said he was “disappointed” in Sessions and reiterated that had he known Sessions would remove himself from the Russia probe, he would not have hired him. “He should not have recused himself almost immediately after he took office and, if he was going to recuse himself, he should have told me prior to taking office, and I would have quite simply picked somebody else,” Trump told reporters. I’m just looking at it … I’ll just see. It’s a very important thing. New White House Press Secretary Sarah Huckabee Sanders indicated that Trump was not going to change his mind, and her boss, communications director Anthony Scaramucci said, “We’ll get to a resolution soon”. US presidents normally go to great pains to avoid being seen as influencing ongoing or possible investigations, making Trump’s attacks on Sessions all the more extraordinary. With pressure mounting from the investigation led by special counsel and former FBI director Robert Mueller, Trump has sought to revive an election year controversy over Clinton’s use of a private server to send emails while secretary of state. The Washington Post has reported that Trump’s team sees getting rid of Sessions as part of a potential strategy to fire Mueller and end the investigation. Sessions, however, has said he has no plans to resign. The website Axios reported that Trump was considering replacing Sessions with another early supporter, former New York mayor Rudy Giuliani. But Giuliani dismissed the report and said Sessions was right to have recused himself from the Russia probe, CNN reported. On Monday, Trump had already wondered out loud why Sessions was not investigating Clinton. The White House also alleged last week that the Democrats colluded with Ukraine during the 2016 campaign, adding another twist to the president’s counter-offensive. Kiev’s embassy in Washington refuted that claim, saying it didn’t help “any candidate” in the election. Trump has expressed increasing anger with Sessions as his Justice Department’s investigations into possible Trump-Russia collusion has quickened. Sessions recused himself because of his role on Trump’s campaign and because he failed to tell the Senate during his confirmation hearings about contacts he had with the Russian ambassador in Washington. Trump’s eldest son, son-in-law and top aides have become entangled in the widening investigation led by Mueller. Jared Kushner, the president’s son-in-law and a top White House official, was questioned by lawmakers on Monday and yesterday. He was asked about contacts with then Russian ambassador Sergey Kislyak, a Russian financier and a Russian lawyer who offered dirt on Clinton. In May, Trump fired FBI director James Comey over the bureau’s investigation into Russia. That led to Mueller’s appointment as a special prosecutor. Sessions’ onetime Republican colleagues in the Senate came to his defense, saying he showed good judgment in removing himself from the Russia probe. “Jeff understands that we are a nation of laws, not men,” said Lindsey Graham. Email “Trump refuses to say whether or not he'll fire Attorney General Jeff Sessions”. Feedback on “Trump refuses to say whether or not he'll fire Attorney General Jeff Sessions”.